Ao pegar essa missão faça-a no mesmo dia! O item Solução Terrivelmente Ácida tem duração de 24 horas e o PNJ Tristão não aparece ao relogar, sair da guarnição, trocar a taverna de lugar ou qualquer outro método que funcione com outros visitantes da taverna. Caso tenha feito quando o PNJ não está na taverna, torça para que ele apareça no próximo dia, caso contrário será preciso entrar na masmorra para pegar o item novamente. Well, Moroes, maybe we wouldn't have scuffed up your precious furniture so badly if you weren't so intent on blinding half the raid, huh? It's kinda hard not to trip over everything when you can't see! But hey, we did sort of kill you repeatedly, so fair's fair. Oh, and sorry about stealing your favorite watch. No hard feelings, right? The quest item is in the second area of the zone in the top right corner on top of a wooden barrel. Level 100 Rogue, went into the instance solo and stealthed to the location where the vial should be. Nothing was there. This is the second quest from the Garrison Inn that the item needed to finish the quest was missing. Seems after the most recent update the quests have been bugged. Good luck stealthing to this, you need to get past a few Ogron Laborers and they have stealth detection. To Get to this area while all the mobs are around you can go behind the archery targets without the mobs attacking you. once you go behind those the item should be sitting on some crates. Mages: Aggro the two Ogron Laborers, pop Mirror Images, then pop Invisibility. Go get your Acid. You're welcome. Soulstone yourself, mount up and carefully ride as far as you can - you WILL pull the two giant Ogrons unless you have Invisibility potions. Get as far as you can and stay away from other mobs, when you die simply use your Soulstone, get back up and ride to the quest item. Easy peasy lemon squeezy! EDIT: The above was valid when you didn't have to kill the end boss to finish the quest. Perhaps this method can still be used if you somehow managed to get quest credit for the end boss but didn't get the item AND you have to go through a new instance *shrugs*. Best of luck! They have given the Orges stealth detection, so you can no longer stealth past them. As a shaman, my solution is to just race though as quickly as possible on a mount past the first group of orcs, ride past the ogres and if you really need to buy some time drop an earth elemental totem here, then ghostwolf towards the item. If the archers spot you, get as far into the corner as you can and let them kill you, and once all clear, self res and grab the acid. As a rogue there is a convenient cockroach next to the quest item which you can shadow step behind to avoid the Ogron's with stealth detection. You may need to jump when next to the fence in order to get it in line of sight. Quest item has a 1 day timer, so if you see the quest as Completed, but can't turn in, don't go over your bags frantically to find the item. Just go Iron Docks and loot it again. Gorum's Anel Precioso de Espinho Sangrento currently works in combat and makes you drop aggro when you go invisible. So you can mount up, streak past all the mobs, and drop into invisibility in a nice quiet corner to lose them, then wait five minutes and repeat the process until you're at the quest item. I ran all the way to it, ducked behind the barrels, and used the ring to get things off me, but classes less survivable than a blood DK might need to do it in two or three steps to avoid getting sputched. The quest item has a 1 day duration (ingame time), if you pick the quest and dont hand it in on the same day Morose will not be in the tavern anymore... and your quest items timer is ticking. You have to wait till he comes back...can take a few days. swapping buildings did not bring him back (this worked for millhouse). This is the only quest I still need to upgrade my Inn but it has been almost two weeks and he hasn't shown up yet. Is this a BUG or is it just bad luck? Is there anything I can do to make him show up or can I pick up quests in someone else's Inn? This quest is SOLOABLE. I just did it. I went in the instance as a 654 Survival Hunter (after the 60% Serpent Sting buff!) and blew it up. I killed the last boss and got credit, but the Horribly Acidic Solution is not there in Normal -- it's only there in Heroic. So you can set it to heroic, go in, sneak to the archers and grab it. Then you can go out, set to normal, and kill the last boss if you're geared enough. Didn't get Skulloc slain credit in Heroic even though I got the achievement, so went and just solo'd last boss on normal. You just need to get the acid in heroic. Then you can solo last boss on normal. Ret pally with 653i and average skill. Just go straight to last boss can skip most trash and all other bosses. Well now I feel like ! @#$ for running Karazhan every week. Can you even get this quest anymore? I have been to the Inn everyday for a month now and havent seen him at all. Is he bugged or something? 2018 -- It is confirmed. 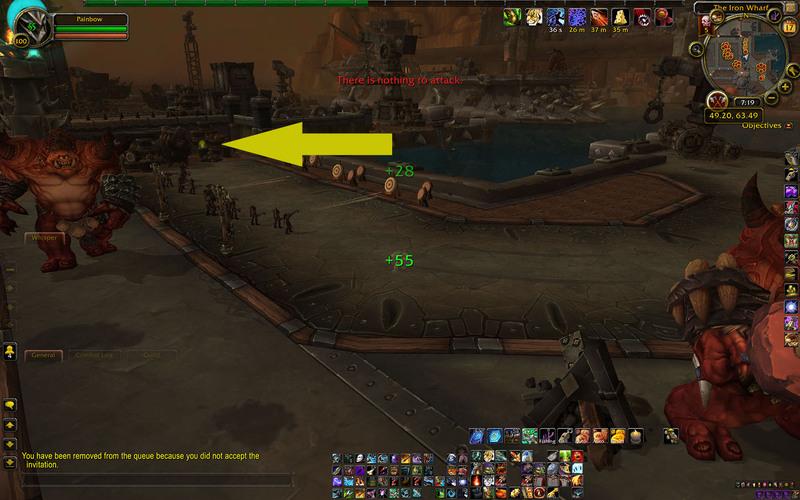 The only shows-up if you run the Iron Docks dungeon on Heroic Mode. The quest was active yesterday. I tried to complete it yesterday and again today, on heroic difficulty, of course. Unfortunately, there seems to be a problem with completing the second half of the quest (killing Skulloc). I've killed him twice now on my 120 mage. First time I one-shot him, second time I killed him a bit slower in case that was the problem. It isn't registering that I've killed Skulloc. I've opened a ticket to see if I can get some answers from Blizz. Will edit this post with the answer once received. In the meantime, if anyone has had this issue and resolved it, I'd be grateful if you would share your wisdom! Edit: Seems to have been a bug. The Game Master didn't tell me what went wrong, but they checked my logs and could see I'd satisfied the criteria of the quest so they gave me the toy. For anyone wondering where the vail is. It after the first boss across the stairs to the left side when you gp east. Its next to the training ranged targets and an iron sub bomb. I've had this quest in my quest log for going on six months now and finally did it today. Came back to the garrison and no sign of Moroes, despite the question mark showing in the middle of the garrison. Leaving the garrison and returning made no difference and he wasn't behind the garrison, either. As a last ditch I tried switching the buildings, and he showed up. So worth trying! Obtenha um barril de Solução Terrivelmente Ácida nas Docas de Ferro. Tantos anos despertando neste corpo semimorto, reanimado por forças misteriosas, causam certos desejos — o conforto aveludado da negra morte sendo o maior deles. E, embora o prêmio seja de menor vulto, eu já me daria por satisfeito em obter um produto para limpar os arranhões deixados na sala de jantar pelos maravilhosos compatriotas d<o/a> comandante, em sua estadia em Karazhan, tão lamentavelmente curta que eles mal tiveram tempo de estragar a valiosa mobília de forma irreparável. One is eternally in your debt for what is, one is certain, an entirely selfless act on the part of the commander. Though more barrels were likely available, one will staunchly make do with the single barrel provided, comforted in the knowledge that the commander must deal with the great pressing issues of this land, and does not have time to clean up the mud that that so dutifully follows the commander's heroic allies.